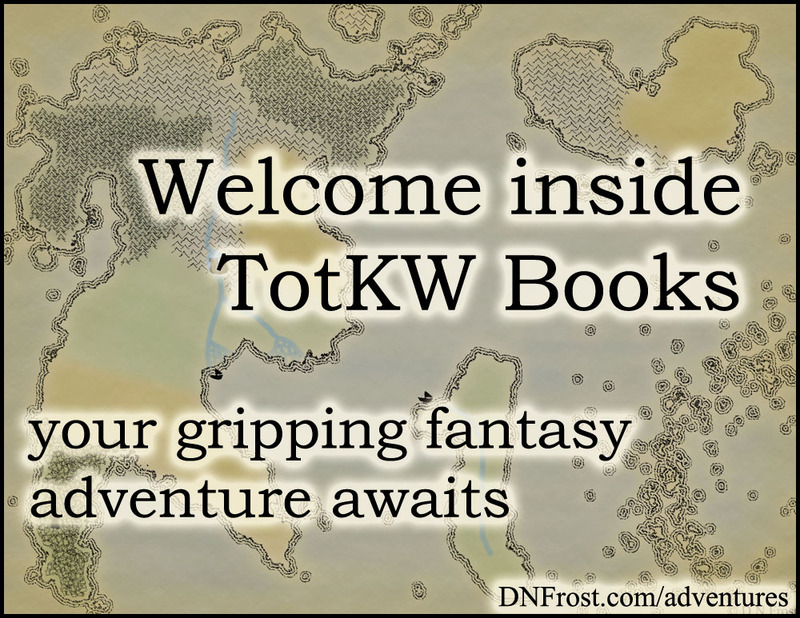 This post is Part 15 of a series to augment the Atlas of the Known World available for free download. Start with Part 1 here. Forsaken waters off the coastal badlands. You voted The Desperate Sea winner of December 2014 by 68%. In Chapter 11 of Awakening, the Desperate Sea lies on the southern side of the badlands of Old Ryerin. Few ships traverse the cursed air spilling from the dead shoreline into its waters. The Desperate Sea enjoys warm tropical weather for most of the year. But as the sticky, languid summer gives way to a winter wet season, these waters suffer the occasional hurricane churning up from the south. 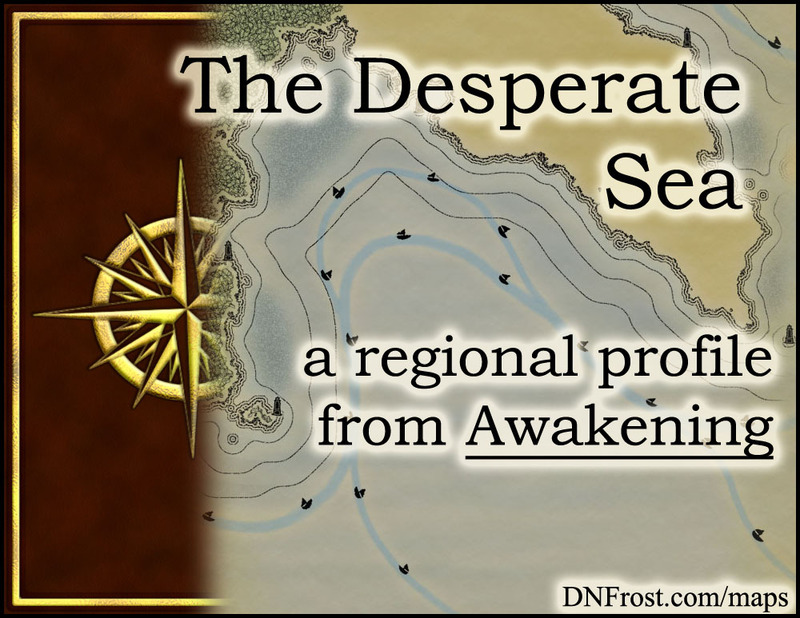 This region also borders the Gulf of Lohki, Glades of Despair, and Great South Sea. Few birds roam the cursed skies over the Desperate Sea, so fish school in huge numbers quite near the surface. Large pods of whales, dolphins, and sea wyverns enjoy the plentiful bounty, as do a great number of sharks, barracuda, and other carnivorous marine life. Ancient coral reefs at the sea's west edge, cultivated by reclusive merfolk, are vivacious and florid, nestled safely beneath the waves and the cursed air above. Though no landfolk traverse the Desperate Sea, the Kaedya Reefs are home to a thriving population of merfolk. A naked people, all mers share webbed fingers and arms, fish-like scales, and golden eyes. However, the Kaedye sport the fluked fins and triple ear-spines indigenous to the western tropics. Like most mers, their streamlined bodies are covered in diamond-shaped scales, and the dark stripe along their spines offshoots thin markings that curve around their ribs and fade at the underbelly. Allied with the neighboring Lohki Reefs to the east and Gusya Reefs to the west, Kaedyan mers rarely travel to other reefs and instead exchange magical communications. Merfolk talents vary less by location and more by the color of a mer's scales. Blue mers display poor sensory magics, whereas their abilities with the prophetic Gift are unmatched throughout the Known World. While the female Gift manifests in visions of the future, the male Gift comes forth in verbal prophesies that can be recorded and shared. Most blue mers are decent elemental mages, demonstrating about equal skill with water and air magics. Green mers, conversely, manifest very poor special magics, but tend to be much better with sensory magic. Skilled light mages with strong latent sound abilities, green mers also are able to use water magic much better than their blue cousins. Mer culture prioritizes knowledge above all else. Their primary means of knowledge acquisition comes from their extensive libraries of documented prophesy. Much time and effort is expended to cross-reference and interpret these portents of the future. Because green mers lack the prophetic Gift, the color green is associated with blight and ignorance, whereas the color blue is royal and esteemed. Shortly after adolescence, blue men relocate to their local rajaweh, a monastic university where they contribute their prophesies and analytic services. Blue women remain in the civilian seyodi, where they legislate the day-to-day lives of their people. Green mers of both genders are relegated to the servant caste, whose homes are sequestered in townships along the fringes of the reef. While the mers measure their age in years, the lifespans of mere mortals pale against the eons of history amassed in their rajaweh libraries. The mer calendar is the foundation of almost every other calendar in the Known World, correlating the 13-year-and-1-day solar cycle with the 72-day lunar cycle to yield an exact celestial calendar of 936 years. Though blue mers do not celebrate coming-of-age, youths are expected to join the monastic rajaweh or the governing seyodi council upon reaching adulthood. The green mers of Kaedya host small family gatherings on the anniversary of a child's birth, until the youth reaches the working age of thirteen. Afterward, that youth may opt to continue the tradition, provided he or she can fund the celebration. Across the Known World, the merfolk are a peaceful race who do not wage war against each other. They disdain the contentious landfolk, and instead they devote their time and wealth to the acquisition of knowledge. According to mer legend, the ancient utopia of Gaweh was destroyed by the first and only war amongst the merfolk. Afterward, the deity known as Mother placed sharks throughout the oceans to discourage future bloodshed. Mother also stripped the defeated aggressors of their prophetic powers and marked them green so their selfish betrayal would never be forgotten. Known as Meri to the landfolk, the mer call their language Vyehedaryn, translating to "of the merfolk." Due to 10,000 years of rigorous documentation and cross-reference, the mer dialects have undergone very little evolution since ancient times. Modern mers disdain Allanic, the uniting tongue of the landfolk, which is derived from ancient Meri but heavily influenced by the ancestral languages of assorted surface-dwellers. Though unintelligible to landfolk, Meri sounds fluid and archaic to Allanic speakers, with a vocabulary similar to the ancient roots of Allanic words. Meri's use of two sonic clicks, /k/ and /s/, make it difficult to master as a second language. Landfolk tend to mimic these clicks using the ejective consonants [k'] and [t's], respectively. Gesticulations and hand signals are exceedingly sparse in Meri, likely due to the complications of underwater motion. 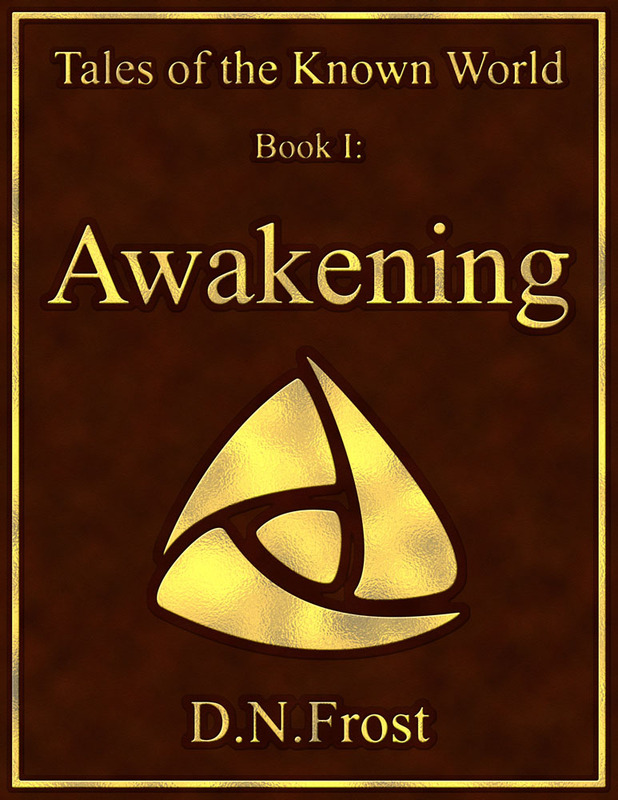 In the book Awakening, Kigal captains his ship into the Desperate Sea after taking on a charter from Kingard and his band of fugitives. Seeking the mythic city A'lara within the Glades of Despair, they drift with the current through the cursed air surrounding the badlands. At last, Kigal emerges into the refreshing breezes of the Desperate Sea's west shore, and the triumphant captain drops anchor off the coast of the glade. Concealing his ship in the harbor ruins, Kigal joins their quest through the jungle to reach the magic city.